Livin' in Bloomington is great! 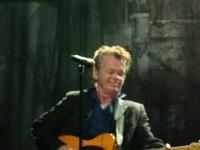 John Mellencamp Community > MELLENCAMP DISCUSSION > Mellenmoments > Livin' in Bloomington is great! I was on my way home from work tonight in my old beater, 86 Chevy pickup. I was going north on Adams St. between 6th and 7th street. I saw an old women in her 80's in a gaudy pink outfit sitting in an old wooden chair in her driveway. I looked at her and smiled because I thought to myself that I felt like I was in a John Mellencamp video. The lady waved and I waved back. I had an even bigger smile. Right after that a Mellencamp song came on the radio. That little moment made my day, (I know, but hey, I'm from Indiana). Re: Livin' in Bloomington is great! Oh, I know. I've lived in Tennessee, and Washington state. Both places have the same kind of people and areas. I just really love Indiana where my roots are! I agree, perfect mellenmoment.....it made me smile reading it. Those are moments that you live for.....something so simple as a glance, a smile and a wave and let's not forget John's beautiful music!